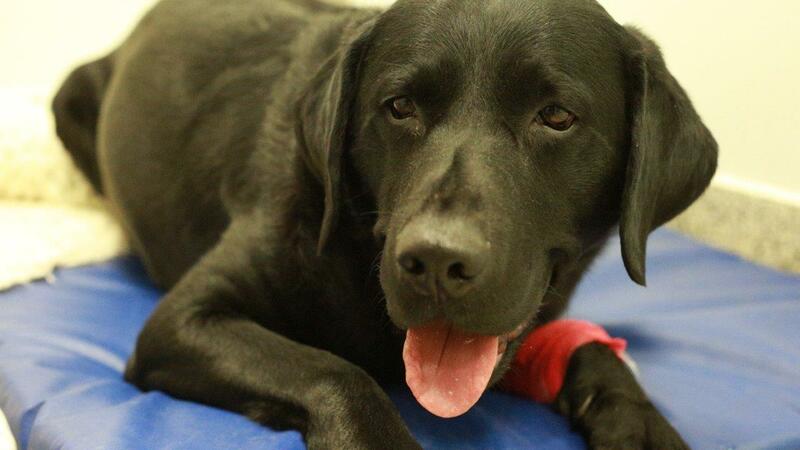 Excitable 6-year-old black Labrador Juke has been referred to Noel with severe pain in his right leg. When Noel examines Juke, he diagnoses severe elbow problems in both legs, which will require total elbow replacement surgery. The road to recovery proves a long and difficult one for the Parkinson family but they are determined to do the right thing for Juke to see him walk without pain again. The Parkinson family have had Juke since he was a puppy, along with another Labrador who sadly passed away. They would like to find a companion for Juke as they sense he misses having a canine buddy around the house, but need to concentrate on getting Juke better first. Juke has been having problems with his elbow joints, which were causing him noticeable discomfort. 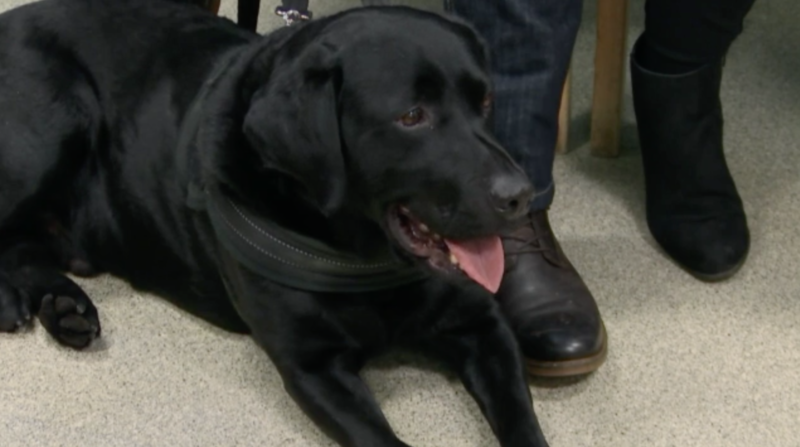 The family saw that it was getting worse so were referred to Fitzpatrick Referrals. Noel identified that Juke was in quite a lot of pain in both his elbows, and had been for a while. In order to know exactly how significant the issue was, Noel ordered a CT scan of both elbows and arthroscopy, which would allow him to see inside Juke’s elbow with a tiny camera. What Noel saw was not good, both elbow joints were extensively diseased and Juke would need partial elbow replacements to relieve the pain. The family opted to undergo surgery on both of Juke’s legs, knowing it was his best chance to be restored to full health and happiness again. Jukes elbows would be replaced one at a time, giving him time to recover from each separately. The implants were carefully designed and custom-made to fit Juke’s bones exactly. Once in theatre, Noel placed pins into the humerus and the ulna bones using a drill guide. The pins would ensure that the implants could be placed in precisely the right spot, with enough supporting bone left around them. A smooth metal surface was implanted into the humerus and a special plastic surface was fitted into the ulna, to replace the diseased portions of joint surface that had been causing Juke pain. Each new surface was incorporated into a special metal backing plate that would allow the surrounding bone to grow into the implant over time. The surgery went according to plan and Juke was sent home 4 days later to convalesce. 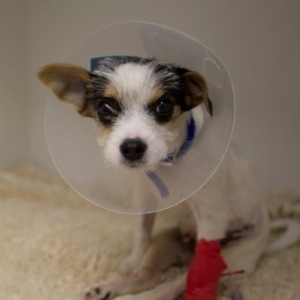 Five months later, and after meticulous care and rehabilitation at home, Juke was back for surgery on his second elbow. Fortunately, once again, the surgery went well and Juke was reunited with his family to start his recovery period again. Over the next few months Juke continued to get better and better, and the family and Noel were delighted with his progress. 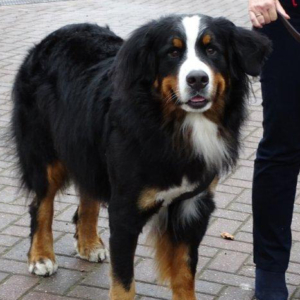 He made such big steps that the family felt ready to adopt a rescue dog called Bailey to keep Juke company. Now the pair can bound around playing together thanks to the life rejuvenating surgery and careful rehabilitation that Juke received.